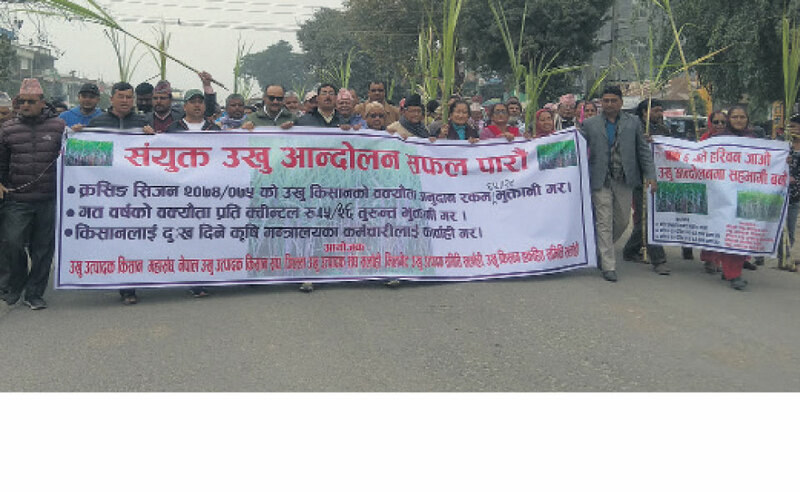 KATHMANDU, Feb 19: Sugarcane farmers from three districts – Sarlahi, Rautahat, and Mahottari – have gathered in Hariaun of Sarlahi to protest against the authorities for failing to provide them the subsidy amount that the government had decided to give them on the sale of sugarcane. They held a protest rally on Monday, and have planned to halt vehicular transport along the East West Highway in Hariaun. They have demanded immediate payment of their dues from both the government and the sugar mills. The government had recently decided that the sugar mills would pay Rs 471.28 per quintal of sugarcane to the farmers and the government would provide additional Rs 65.28 per quintal in subsidy. However, as per an estimate, the farmers are yet to receive around Rs 600 million from the sugar mills and Rs 900 million from the government. Farmers have said that both the mills and the government have ignored their problems. “Both the government and mills have been deceiving the farmers since long. We always have to beg for our own money,” said Kapil Muni Mainali, president of Nepal Sugarcane Producers Federation. He further warned that the farmers may go to indefinite protest and road blockage if they were not paid their due amounts by Wednesday. According to Mainali, the farmers were facing difficulty in receiving the government subsidy because of cumbersome bureaucratic formalities. Meanwhile, the Ministry of Agriculture and Livestock Development claimed that they have paid the subsidy amount to the farmers of Bara, Sunsari, Morang and Kanchanpur districts. The farmers have asked the government to devise a long term solution for this problem. “In the last month of December, 2018 mills had signed an agreement with farmers committing to clear their dues within 45 days,” Mainali further added. While the country’s own product is not getting proper market, huge quantities of sugar is being imported each year, he said.